Microsoft has been trying to make the concept of ads in operating systems acceptable for a while now, using Windows 10 as its testbed. We've seen lock screen ads, notification ads telling you that Chrome is eating your battery and you should switch to Microsoft Edge, and even some weird targeted pop-up ads for Chrome users informing them about Microsoft's Personal Shopping Assistant. The ad has started showing up a lot this week, so you may have already seen it. Sure, Microsoft could say that this is simply 'promoting' the OneDrive cloud storage service, which incidentally also comes from Microsoft. But we'll just call it what it is: an ad. And a pretty intrusive one at that. To get rid of it forever (since it may come back if you just click "Not now") you need to go to View > Options in File Explorer and turn off "Show sync provider notifications". And yes, as implied, the drawback is that this will turn off all notifications for all sync providers. 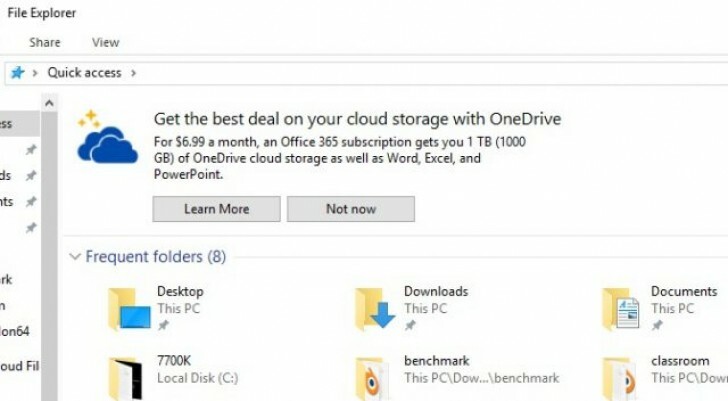 There is however no other way to permanently kill the OneDrive ads. One of these days someone will invent an ad blocker for your operating system. We're almost there. Id rather have these ads to cover microsoft's lost revenues in releasing a new windows every few years than to have a new windows every few years!